The Office of Diversity & Inclusion works to support the hiring, development, and retention of traditionally underrepresented groups within science and medicine. In addition, we aim to foster a culture in which inclusion is appreciated and nurtured among the myriad constituents comprising the Biological Sciences Division. Our work focuses on not just race and ethnicity, but also the ways sexuality, gender, class, and religious identity impact our community. Lastly, we believe that the study of science and the practice of medicine are made most productive when scholars and clinicians can insert their full perspectives into the work that they do. 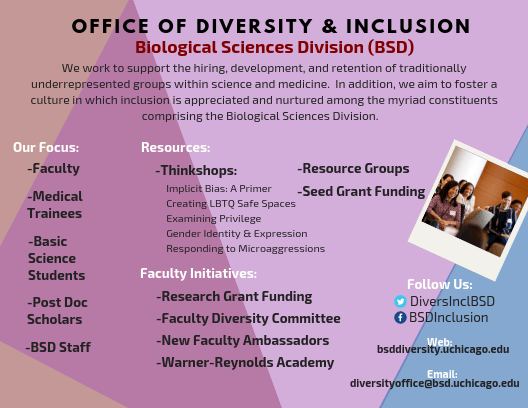 The Biological Sciences Division’s (BSD) Office of Diversity and Inclusion was established in 2011 with the appointment of Melissa Gilliam, MD, as the first Dean for Diversity and Inclusion. This new role was established to advise the Dean on institutional policies and practices the BSD could put into place to enhance diversity and promote a more inclusive environment. Dr. Gilliam engaged with senior leaders including Brenda Battle, RN, BSN, MBA, UChicago Medicine’s Vice President for Care Delivery Innovation and Chief Diversity and Inclusion Officer, and Monica Vela, MD, Associate Dean for Multicultural Affairs in the Pritzker School of Medicine to develop an enterprise-wide strategy to promote diversity, inclusion and equity across the BSD, UChicago Medicine and the Pritzker School of Medicine. The Diversity & Inclusion steering committee was established to provide ongoing direction and oversight of the implementation of this strategy. In 2016, Melissa Gilliam was appointed as Vice Provost for Academic Leadership, Advancement and Diversity for the University of Chicago, and Iris Romero, MD, Associate Professor of Obstetrics & Gynecology, was appointed as Dean for Diversity & Inclusion in the BSD. Dr. Romero leads our efforts in creating opportunities and mechanisms to support the diversity of identities, beliefs and ethnicities, of the faculty, students and staff affiliated with the Biological Sciences Division, Pritzker School of Medicine and UChicago Medicine. Recent efforts have included the establishment of a new Faculty Diversity Committee and the launch of Resource Groups.